Dang it. Why do all of these books make me cry. I may have to stop reading her books. I honestly read this book just for Tessa and Jem. Even though they were in there for like 2 mins. But I needed up liking this book more than I have the last two books. It was still a bitter sweet end for me. I am however glad that this series is over. I will read her next series. 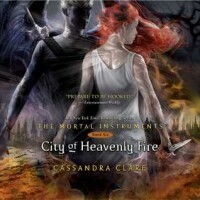 Halloo Jem and Tessa might be in it. Even though Jem is now mortal and I am sure he will die at some point because Cassandra Clare likes to make me cry.